Shower Trolley TR 2000 | H.S.-medplan Kft. 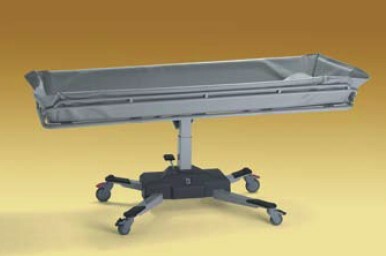 TR 2000 is a hydraulic operated Shower Trolley and is unique with its side mounted column, allowing the trolley stretcher to overlap the bed surface further for a safe and easy person transfer. The trolley side rails are secured before transferring away from bed and can be folded inwards when passing through narrow doorways. The shower trolley height adjustment is foot operated to give the attendant both hands free to tend the person. It can also be tilted to a “Trendelenburg” position. TR 2000 has a Working Load Limit of 150 kilos / 330 lb .